Purple Iris Perspective: How Free is Free Shipping...Really? The holiday shopping season is upon us and more and more shoppers are turning to the internet for convenience (and less stress) when meeting the demands of all those Christmas Wish Lists. So, I thought I'd offer a tip to help ensure you're getting the best deals out there while also reducing the probability of buyer remorse and the dreaded return process. One trend that has become popular among retailers is offering "FREE" shipping, but have you ever asked yourself, "Is it really free?" Being one who's been selling online for six years now, I can honestly answer this question by simply saying that it's NEVER free because somebody has to pay for it. It's just a matter of who is actually paying for it. Unfortunately, not all shoppers are aware that it's often just a gimmick that is abused to lure you in. I believe part of the reason for that lack of awareness is because you can't always see the total cost of a product when browsing the countless offerings, whether via a search engine, a marketplace venue like Amazon, Etsy or eCrater, or a retail store's site. Not even all price comparison sites provide that information or, if they do, they're not including every possible product offering available because they only show those offerings from paying member stores. More often than not, you have to actually go through the checkout process to see just how much you're required to pay for a product (unit price, shipping/handling, and sales tax). So, while one site might offer free shipping, it could be that someone else who isn't offering free shipping may have the better deal -- and that better deal might be on a completely different site than is shown. Let's take sites like Overstock and Wayfair as examples. They both offer either low-cost or free shipping, but do they actually have the better deal? I've shopped (or browsed) both sites and have found that they usually don't. Not once have I bought anything from either site because there has always been someone offering a better deal elsewhere despite adding a shipping/handling charge to the final cost. So, how can you tell if a site is actually offering free shipping? You simply need to do your research, comparing prices at various sites, and do NOT rely on price comparison sites alone. You need to search the world wide web. If a site is truly providing free shipping, then the item price won't be inflated above what others are offering it for -- meaning they're actually charging you for shipping, but are hiding it in the item price. Rarely do I offer free shipping in my own store simply because I'm not one to use deceptive practices to lure customers in. I will only offer it when I have chosen to eat the cost of shipping, meaning the item price is the actual value of the product (or less) and there is no additional charge for shipping. That also means that a customer who lives closer to me is not paying the cost to ship an item to a customer who lives farther away. For example, I once had a valuable Josef Originals doll up for sale with free shipping. The value of the doll itself was $130-150 and I only found one other being offered on another site at $129.99 plus shipping. So, I offered mine at $129.95 with free shipping. Not only did I offer it at the low-end of its market value, but I didn't charge extra for shipping. So, in that case, the shipping truly was free to the customer who bought it because I chose to eat the cost of shipping by paying for it out of the item price. However, in the case of the stained glass items I sell, they are large, heavy items that cost quite a bit to ship and the cost varies greatly from one shipping zone to the next. If I were to offer free shipping on those items, my profit margin would vary greatly depending on how far I had to ship an item, resulting in deep cuts in profit when shipping to more distant locations (Shipping Zone 8 or 9). Unless, of course, I inflated the price to cover the cost to ship that item to the farthest point from me -- but, if I did that, then the shipping wouldn't actually be free, now would it? Not only that, but customers located closer to me would be overpaying for shipping. So, nope, I don't offer free shipping on those items. 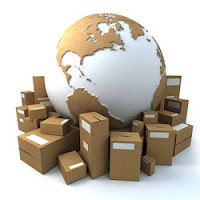 Everyone pays the same item price and the appropriate shipping cost based on their own location. Another thing to consider is that free shipping isn't always the best option. The reason being that "free" shipping usually means the cheapest, slowest shipping method. The holiday shopping season is the busiest shipping time of the year, which means longer delivery times -- sometimes significantly longer. Especially if Mother Nature decides to wreak havoc on shipping routes. So, if you're opting for free shipping, you should allow at LEAST two weeks for your package to arrive. Hopefully the above will give you a better understanding of how it REALLY works in the world of online shopping. Don't let yourself be so quickly drawn in by the offer of low-cost or free shipping because it may not actually be the best deal. Like I said, search the world wide web and make your own comparisons, even if it means "pretending" to checkout just to see what the shipping will cost (just make sure you don't click that final payment button).